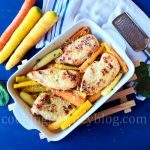 Baked chicken breast with roasted carrots is easy and delicious meal to have on your Easter dinner menu! Sweet glazed carrots with tender roasted chicken breast is one of my favorite Easter recipes. 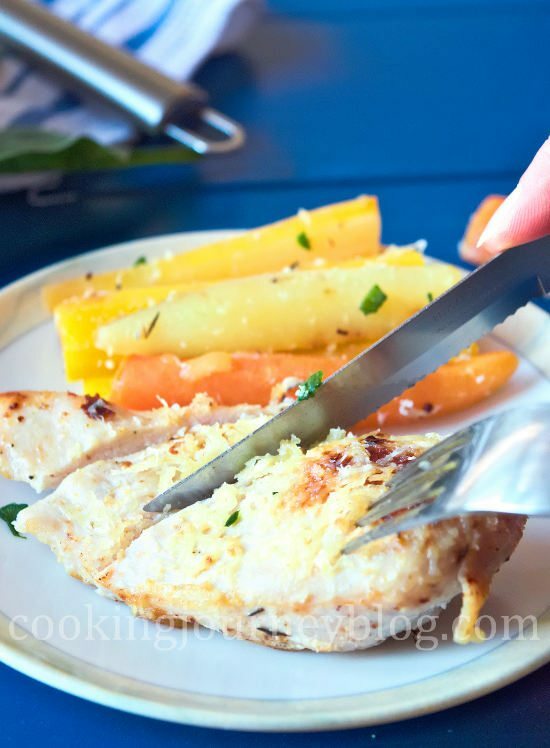 However, this easy baked chicken is a great healthy dinner idea for every day. 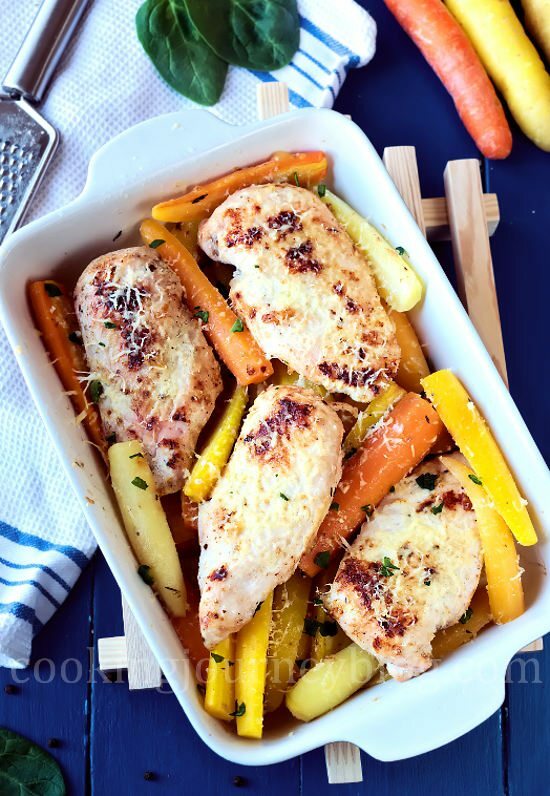 What’s great, chicken with vegetables is a one pan dinner, which means easier clean up! 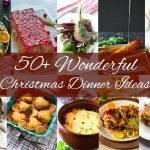 So do you need and Easter dinner, which is easy to prepare, looks great, tastes delicious and is easy to serve and clean afterwards? Well this is one of baked chicken recipes that you need! If you plan to serve baked chicken for Easter dinner, roasted carrots are colorful and healthy side dish. This time of the year you can find baby carrots different color. I love that they give this dish such lovely orange and yellow colors that turns every dinner more special. Roasted carrots are also so inviting, they are sweet and juicy. Now I know many people, who doesn’t peel baby carrots. But if they are not from your own garden, I better prefer to peel them. Young carrots are thin, so they bake faster. I decided to cut the carrots in half lengthwise, then in half again – for easier serving. Honey glazed carrots are quite popular around the Easter and it is a tasty dish to serve with a chicken breast. However, some of the guests may have allergies for the honey, some don’t like the taste of honey. Or maybe you already served honey glazed carrots last year and now want to try something different? So a great substitute to honey is pineapple juice. No, don’t worry, you don’t need the juicer here. I used pineapple juice from the can. Yes, it is sweeter and more dense, perfect to sweeten the carrots and chicken. You can leave pineapple wedges for later, for your desserts. I hope you don’t discard this liquid, do you? Pineapple juice from the is my favorite part, actually, not the fruit wedges, haha! Pineapple juice will sweeten your dinner dish and will give a subtle fruit accents, that goes great with chicken and, especially carrots. Have you ever tasted pineapple and carrot juice? Do you like Hawaiian pizza with chicken and pineapples? Tomato sauce with pineapples? Well, you know what I mean. I have a crush on pineapples, I don’t know why… Wherever I see a dish with this magical fruit, I choose it instead of similar other dish. But, you know, it tastes great not only in desserts, but also in savory dishes like this chicken breast dinner. And if you ask me, yes, you can cut some canned pineapples and serve it with roasted chicken breast meals like this one. To make this dish, you need to arrange some carrots in your baking dish, then place seasoned chicken breasts, brushed with sour cream. Add pineapple juice on top of the carrots and chicken. Baked chicken breast time is about 30 minutes until no longer pink. The temperature of the oven 350 F / 175 C.
You can check the chicken with a fork, if you see only white juices, you can turn off the oven. If you have food thermometer, that’s great, the temperature in the thickest part of chicken breast should be 155 F / 68 C. Then let it rest for about 10 minutes before slicing. You can grill the dish for a few minutes or pan fry the chicken with butter, to make it more browned, but it is optional. I recommend to spoon juices from time to time during the cooking. Add more pineapple juice if there is nothing to spoon… Just like cooking the turkey for a Thanksgiving, you need to smear the chicken with juice, so it won’t be dry. But you don’t need to make a carrot soup here, so don’t add to much too. I baked chicken breast with carrots without any foil or lid on top. If you have a glass dish with a lid, you can use this dish too, but chicken breast will cook faster. Don’t wrap the dish with a foil, as you need to see the process of cooking and add more juice, if needed. Roasted carrots will become softer, but won’t be mushy. So it will be pleasant to taste tender chicken with soft, but chewy carrots. You can serve it in the same pan that you cooked as a main dish for Easter dinner. Moreover, you can leave the dish in the fridge for up to 7 days. Reheat it in parts or the whole dish for about 10-15 minutes in the oven. It’s up to you if you serve the whole breast per person or a half. My chicken breast were quite small, so I served 1 per person. By the way, if the chicken breasts are big, you should regulate the time accordingly or cut it in half. However, I don’t recommend cutting the chicken in smaller pieces, as they can easily overcook and dry out. If you have an option, choose smaller chicken breasts that were raised without antibiotics! If you think this is too small for serving, you can add a tablespoon of cooked Basmati rice or Cauliflower rice for every dish. Or serve a bowl with rice on a side. Our Cauliflower rice recipe is a great low carb side dish. 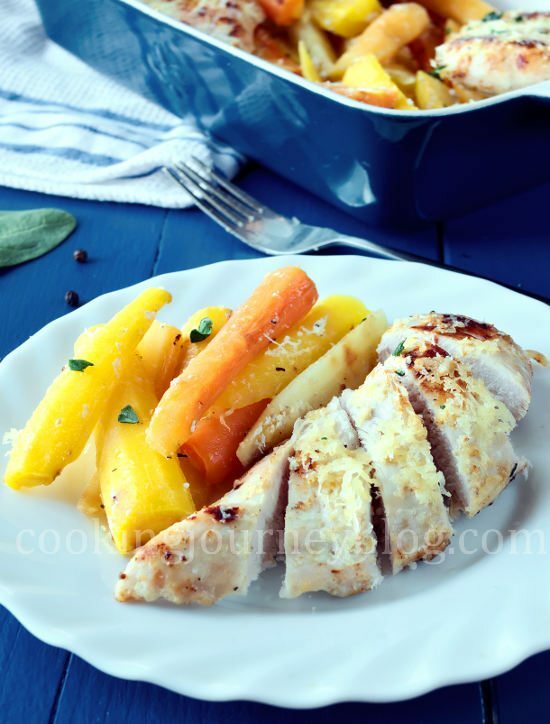 Hope you enjoy this baked chicken breast recipe with colorful roasted baby carrots! How do you like to serve a chicken? Leave a comment bellow, we would like to know! For more dinner ideas, check our Beef with potatoes. To plan your Easter brunch, check our Spinach quiche. For easy Easter desserts, check our Mini cheesecake recipe with surprise inside! 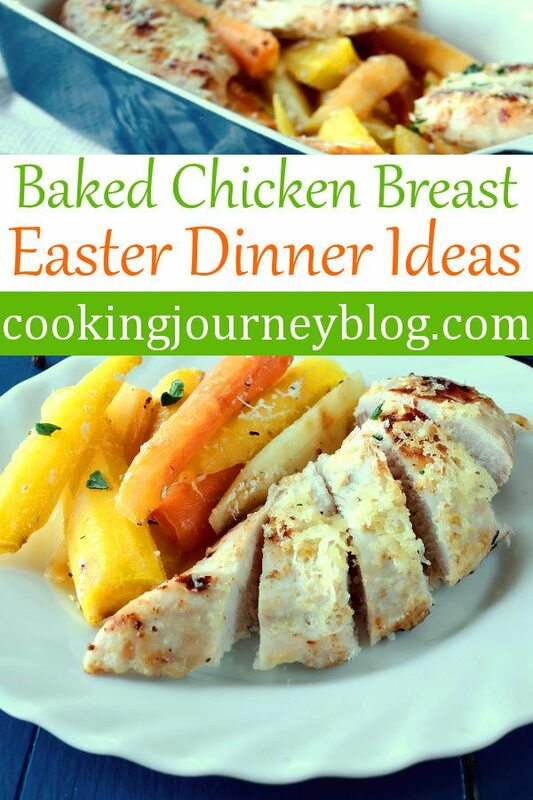 Baked chicken breast with roasted carrots is easy and delicious meal to have on your Easter dinner menu! Sweet glazed carrots with tender roasted chicken breast is one of my favorite Easter recipes. 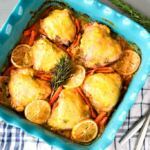 However, this easy baked chicken is a great healthy dinner idea for every day. Peel carrots, cut lengthwise, then in half. Arrange carrots in your baking dish. Seasoned chicken breasts with salt and pepper, brush with sour cream - from both sides. Put chicken breasts on the carrots. Spoon pineapple juice on top of the carrots and chicken. 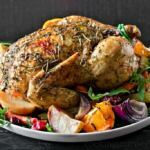 Roast chicken with carrots for 28 minutes or until poultry is no longer pink. Spoon juices from time to time during the cooking, from the bottom of the pan - on the chicken. If there are no juices, add a little bit extra on top of the chicken and carrots. Sprinkle cheese on top of the chicken and bake 2 minutes until it melts. Let the chicken rest for about 10 minutes before slicing. Serve with sprinkled spinach or parsley on top. * You can check if the chicken is ready with a fork: if you see only white juices, you can turn off the oven. The temperature in the thickest part of chicken breast should be 155 F / 68 C, if you check with food thermometer. * You can grill the whole dish for a few minutes in the oven or pan fry chicken breasts with 1 tbsp butter to make it more brown (optional). 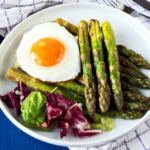 This looks so tasty but easy too, love it! 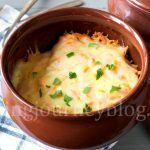 This sounds so wonderful I just love the idea of a new chicken recipe thats unique like this one! love that pineapple juice! Thanks, Claudia! Pineapple juice adds the sweetness and makes this chicken dish special. loving the simple but delicious flavors in this dish. 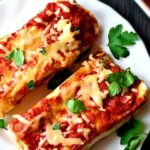 this would make an awesome meal prep idea for weekday lunches and dinners! Absolutely! You can store it in the fridge up to 5 days and reheat, when you’re hungry. I like the colorful carrots here! interesting idea to use pineapple juice instead of honey. Thanks, David! Pineapple juice adds something new, but so simple and familiar.